On Mother’s Day, my husband was ready for an adventure. So, he chose a day-trip from our Northeast Oregon home to Palouse Falls in Southeastern Washington. We had the time. Why not. So, he packed up a picnic and off we went. We drove north and northeast through rolling wheat fields for miles and miles. The terrain did not seem to change much. The road took us up and over and down larger hills. The terrain finally changed. Basalt rock outcroppings. We found our turn-off. Other vehicles found it also. They had the same idea. Go figure. Mother’s Day, warm sunny weather and families were out exploring. Jeff had thought there would be only 2-5 cars there…. I laughed. We got to Palouse Falls State Park just as everyone else and their picnics had. We had our picnic and went off exploring the overlook of the falls. We gazed at the waterfall, watching vast amounts of water cascading over the basalt cliff and falling down into the pool below….. sharing some water droplets with the sunshine to make a rainbow. Made me think that Mom was with us, enjoying her Mother’s Day. Through example, Mom instilled in me a faith that “things will get better.” She taught me that not all will be gloomy or be bad, even though it may seem as if. Mom helped me to see the good side of things. To look on the bright side. When Jeff and I left for our ‘second honeymoon’ in mid-March celebrating our six-month wedding anniversary the skies seemed gloomy and the Blue Mountains donned a new blanket of snow. The mountains were absolutely beautiful, yet the day before had been a sunny, glorious day. We headed south to catch the freeway. To the east was snow….. to the west… SUN. Luckily, we were ready to head west. Off to the Oregon Coast. Amidst sunshine, clouds and rain and after three hours of driving we arrived in Hood River for lunch. A much anticipated lunch at Full Sail Brewery. The three hours plus of a few days of anticipation I endured for their pulled pork sandwich and a Session Black had paid off. Ahhh Bliss. Well worth the anticipation. We traveled on and arrived in Portland, got checked in to our hotel and made arrangements to meet cousins from my side of the family for dinner. We had a great time. Lots of catching up and laughing. After driving in more late winter inclement weather we were having some wonderful family time. The next day we made a trek to a local mall so I could make another anticipated stop… this time at Teavana, to accommodate one of my favorite habits, tea drinking. Again, it was raining, but now after a quick and early lunch in the car we were headed to the coast. Driving out Highway 26 we experienced a variety of weather. Clouds, overcast skies and rain, then more rain. Yet it was a pleasant drive with scenery I don’t remember seeing before. Maybe, I had not been on this highway. Then, while driving over the Coast Range the rain got thick. Then thicker. Then turned to snow. SNOW in the Coast Range on March 12th. No worries, both Jeff and I had driven through plenty of snow before. Be careful. Be aware. Drive on. I had not personally seen snow in the Coast Range for several years when my brother and I had driven to the coast early one May. I knew it snowed in the Coast Range, I’d seen it on the news from Portland. 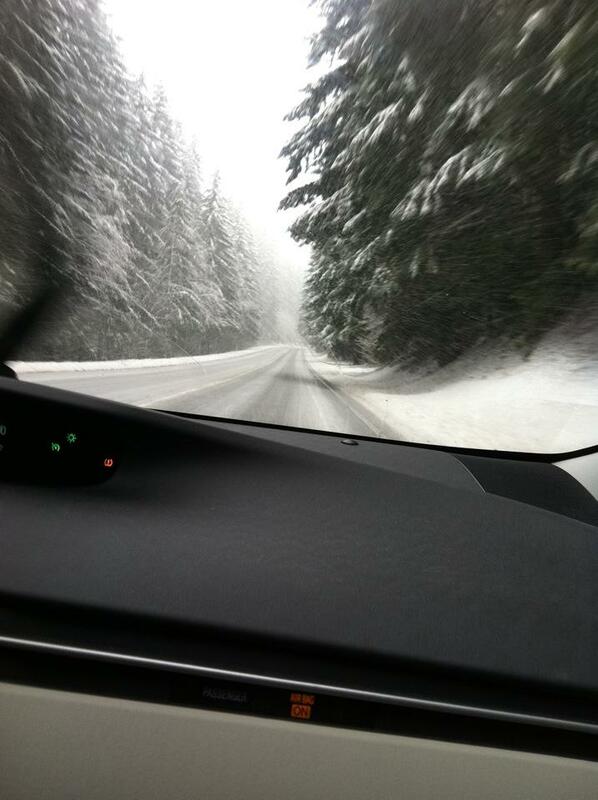 Through all the variations of weather, mostly winter-like, we made it to our destination … Cannon Beach. 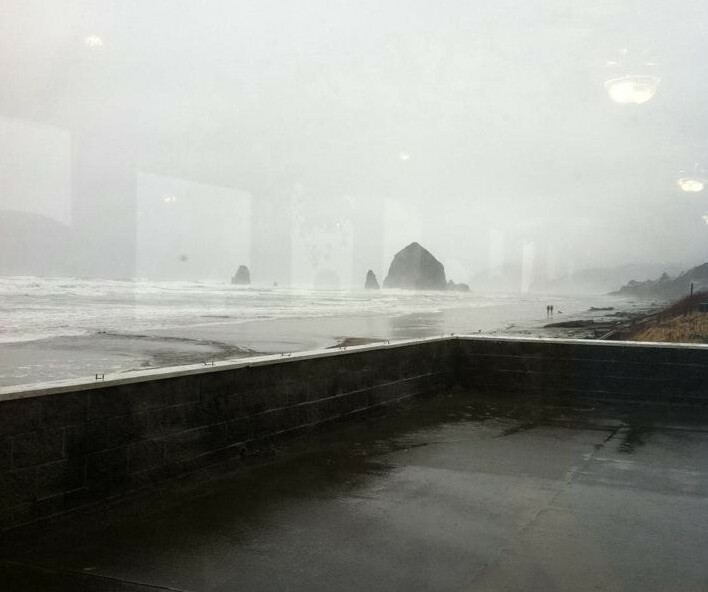 We sat inside Mo’s Restaurant anticipating our first seafood of our Oregon Coast trip, watching the stormy, almost angry surf. As you already know, the rain was falling. There were also lots of clouds and some wind. The tide was high and the ocean seemed as if it wanted to come inside to get out of the weather too. As we waited for our food we watched as some travelers were getting soaked in the rain. Some were even on the beach taunting the waves. I was nearly certain that someone would be overtaken by the crashing waves. The waves did not really seem to want to play. Ahhhhh…. our food had arrived. Another payoff for enduring something less than delightful. 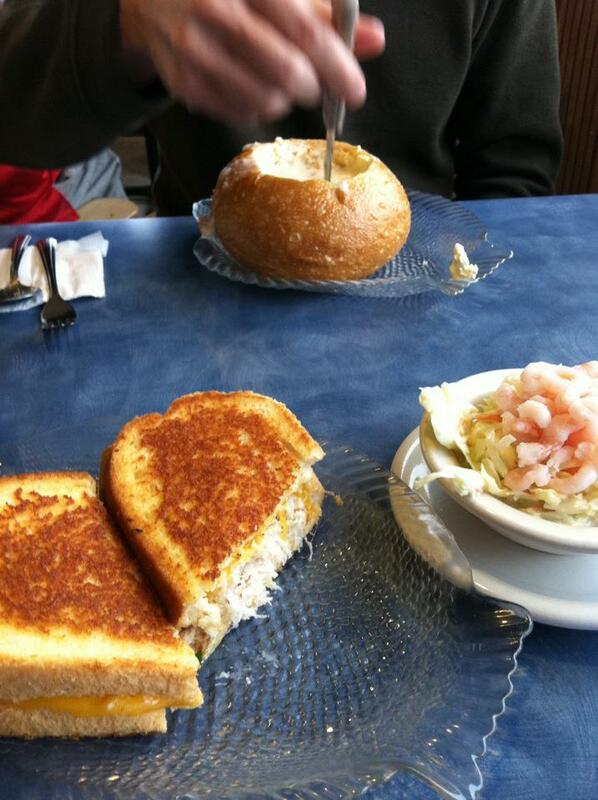 I had anticipated CRAB — in the form of a crab melt. Jeff was rewarded with a bread bowl filled with chowder. We were about to eat while watching the storm from inside, not being out in it. Now, after driving through all that rain and snow and slush, our payoff had arrived.